Mikhail Kalashnikov was a renowned Russian weapons designer, most famous for designing the AK-47 rifle. Mikhail was born in 1919 in Kurya, Russia. His parents were peasants and were deported under the regime of Stalin in 1930, due to which they lost all their property. The family moved to a village where Kalashnikov’s father would often hunt. Thus Mikhail was familiar with the use of a rifle from an early age. He was seriously ill at the age of six, and was almost on the verge of death. He recovered, however, and started school. He was deeply interested in poetry and at one point even considered becoming a poet. When Kalashnikov was a little older, he obtained his father’s permission to go back to his hometown. After hitchhiking for almost a thousand kilometers to get there, Kalashnikov started working as a mechanic. During this time he became deeply interested in weapons and was inducted into the military in 1938 as a tank mechanic, where he later became a tank commander. During his time in the military, Kalashnikov started designing weapons as well as improvements to the structures of tanks. For one of his earlier efforts in weapons design, his general awarded him with a wristwatch as a token of appreciation. Some of his earlier designs in the military include “tank gun shots counter” and “running time meter for tank engine” which took several months for him to develop. Kalashnikov was wounded in combat in 1941 and remained hospitalized until 1942. During his time at the hospital, he got the idea of developing a new rifle for the military when he heard soldiers discussing the shortcomings of the existing weaponry at the time. Mikhail Kalashnikov developed a design for a submachine rifle which was initially rejected, but helped him to get noticed in the higher ranks as a talented designer. During his career, he designed almost 150 models of small weapons, but the most famous ones include the AK-47, AK-74, AK-12 and the Saiga semi-automatic rifle. The AK-47 (which stands for Avtomat Kalashnikova model 1947) was entered in an assault rifles competition in 1945-46 and Kalashnikov’s entry was chosen as the winner over the models of two much more experienced weapons designers. Both contestants acknowledged the superiority of Kalashnikov’s design. The AK-47 became the standard assault rifle used by the Soviet army and is undoubtedly Kalashnikov’s most famous invention, used in over a hundred countries and represented in the national symbol of many. Other Kalashnikov inventions include light machine guns and self loading carbines. Just a few of Kalashnikov’s awards include Hero of the Russian Federation, Order of Military Merit, Stalin and Lenin Prizes, Order of Honor of Belarus, Order of Friendship and various other medals, military honors and foreign awards. 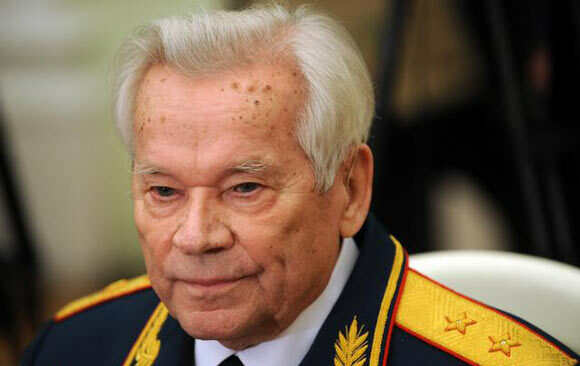 Kalashnikov died at the age of 94 on 23 December, 2013. Before his death, he was repentant that his invention was used so widely to kill and spread violence. He was a religious man and wrote to the leader of the Russian Orthdox Church, admitting his feelings of guilt. The Father reassured him that his invention was for the defense of his country, and the blame should lie on those who abused its power. Yet, Kalashnikov was sometimes ridden with guilt and is noted to have said that he wished he had invented something that would help people instead of killing them.